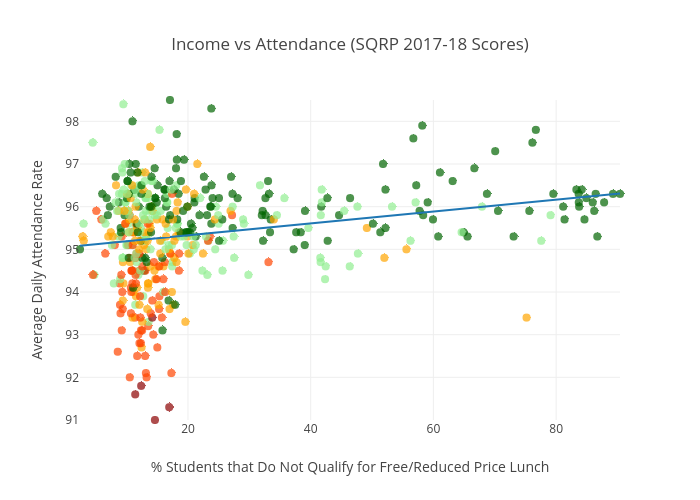 Lukeshepard's interactive graph and data of "Income vs Attendance (SQRP 2017-18 Scores)" is a scatter chart, showing Linear Fit; with % Students that Do Not Qualify for Free/Reduced Price Lunch in the x-axis and Average Daily Attendance Rate in the y-axis.. The x-axis shows values from 2.4000000000000057 to 90.41. The y-axis shows values from 91 to 98.5.